Naturally, I was far from alone in feeling touched by this discord, and last autumn a Shambhala member asked if she could underwrite a conference and fundraising benefit for the Rohingya people in Boulder. Clearly the thing to do was say yes! 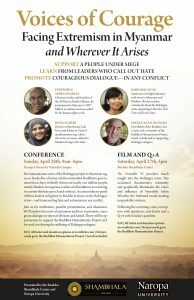 On April 28th, the Boulder Shambhala Center will host a conference, Voices of Courage: Facing Extremism in Myanmar and Wherever it Arises, at Naropa University. We’re fortunate to be hearing from a number of voices that will shed light on the status of the humanitarian crisis today and share with us their varied and inspiring responses to it. As the title suggests, and recognizing that the humanitarian crisis in Myanmar and Bangladesh is nothing short of epic, we know that sharp divisions occur in every corner of the world. Our daily U.S. news is full of this. Hate crimes are on the rise. Social media outlets present endless and unmitigated hate speech. The tenor of intolerance seems to have reached fever pitch. 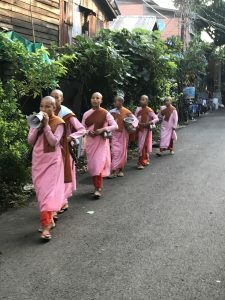 Like other groups, we Shambhalians long to understand how to create the causes and conditions for genuine, brave, and compassionate dialogue to occur across divides. While our initial focus on Sunday will be on the crisis itself, we’ll then turn our attention to exploring how we can work with division and hatred in our local communities, our country, and beyond. Ven. Ashin Issariya, founder of the All Burma Monks Alliance and featured speaker at Voices of Courage. Photo by Larry Steele. traveling to Boulder for the event: the Venerable Ashin Issariya is founder of the All Burma Monks Alliance. 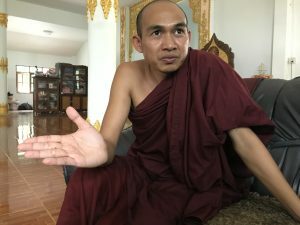 He was a leader in Myanmar’s 2007 Saffron Revolution and was exiled for years for his human rights work. The panel also includes Hena Zuberi, Director of the Burma Task Force, and Editor in Chief of muslimmatters.org, where she writes on issues related to Muslims living in the West. And Khin Mai Aung, an American civil rights attorney with roots in Myanmar and Rakhine, who has written extensively about the Rohingya crisis with articles appearing in Lion’s Roar and the New York Times. Hozan Alan Senauke, Vice Abbot of the Berkeley Zen Center, will facilitate the panel discussion. He is co-founder of the Buddhist Humanitarian Project, which is dedicated to supporting the Rohingya refugees. Net proceeds from ticket sales, and all funds raised at the conference, will go to BHP. At this difficult time in Shambhala it feels worthwhile to turn our attention, at least to some degree, away from our own heartbreak and toward the unimaginable suffering of this humanitarian crisis. We offer these events not only for their own sake, but as a way for us to deeply consider the dangers of extremism, and to extend outward to promote a more courageous, tolerant, and wholesome society. Melanie Klein is Executive Director of the Boulder Shambhala Center. She holds a divinity degree from Naropa University and is an ordained chaplain, teacher, and meditation instructor in Shambhala.